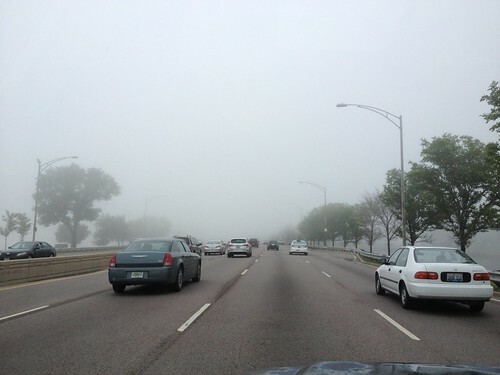 As promised, here are the foggy Chicago photos from a week ago. I was west of the Lincoln Park Zoo, just off Fullerton, for those who know their Chicago. This is about 2 miles from the lake itself. 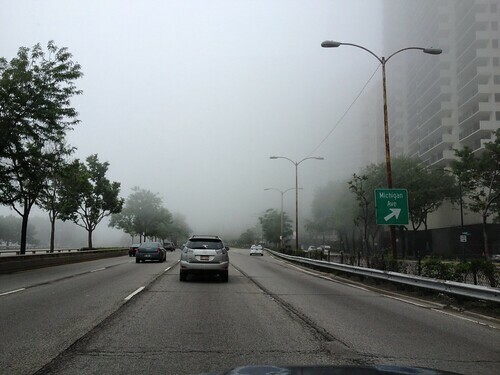 When I was done, I headed east on Fullerton to pick up Lake Shore Drive to go south toward "the city", i.e. the location of all the skyscrapers, and connect with the interstate to head back to the office. This is just north of the zoo. What was so interesting about this fog was that it came in waves. The sky would brighten a bit and then the next ribbon of fog would come. Lake Michigan is about a quarter of a mile east of here. Turn right and get on Lake Shore Drive, the iconic road that winds from Hollywood down to 65th Street, running along the lake. It can be called "LSD", but most people I know who are natives call it "the Drive". The zoo is to the right and the lake is to the left. The Drive was still reasonably busy at 10:15 a.m. so I didn't really oogle the lake. Didn't have to. The atmosphere of the heavy fog was enough for me. Straight ahead of me should be the beginning of the "Magnificent Mile" if you approach it from the north. You see, to the right, the sign pointing to Michigan Avenue. Oak Street beach is to the left off the photo and the only true "S" curve left on the drive is approaching. Putting the camera away. Now that traffic is stopped for the first of about a dozen traffic lights east of Chicago's downtown proper, I could pull the camera out for a last look at the fog. To the left should be Navy Pier with Lake Point Tower and the ferris wheel. Um... The lake was a dark green color, not real choppy. The fog only went inland a couple miles and by the time I'd crossed the river, it was mostly gone. 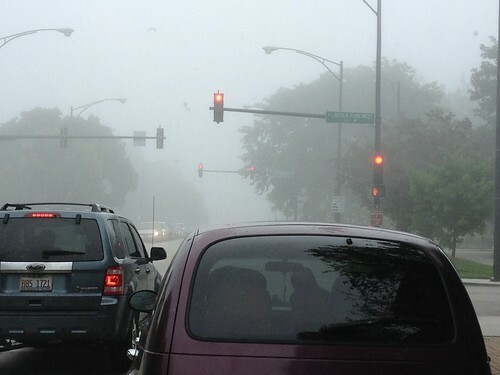 We haven't had these kinds of fog in the 'burbs. I love being out in this, drinking in the water droplets, feeling the dew on my face. 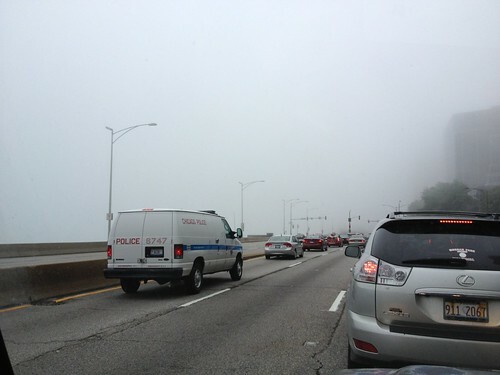 It takes a special kind of weather to get this heavy fog. I have no idea how tall it went either. As much as I'm afraid of heights, I'd love to be up in a multi-story building where the floor was in the middle of the fog and then above the fog. Of course, if I was above the fog, I'd probably be standing 10 feet from the window sayings, "Yes, I can see. Looks nice."